Our Congregation was started in Indonesia on October 7th, 1918. When ten of our Dutch CB sisters arrived at Tanjung Priok, Jakarta. It was our first mission outside the Netherlands. 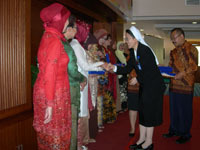 As a Congregation we were asked to come to Indonesia in order to run a Catholic hospital and to take care of the sick. 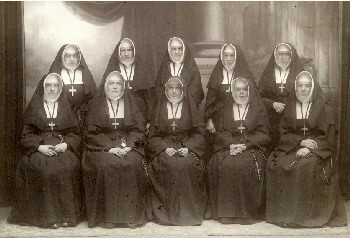 Our sisters started this mission with great faith and hope. We do believe that God, who had called us, never ceased to accompany us with His endless blessings. We grew fast and we extended our services to other places outside Jakarta. We opened our hearts and hands in responding to the needs of the Indonesian society. Hense, we perform several kinds of ministries in different parts of Indonesia. The seed the sisters had sown bore fruit abundantly. In 1933 a group of three young women expressed the desire to join our Congregation. This is when we first began tot admit new members into postulancy en novitiate. In 1967 Indonesia became a ‘province’ of the Congregation, with a provincial board. The Province consists of 38 communities. In 2002 East Timor becomes an independent state, called Timor Leste. 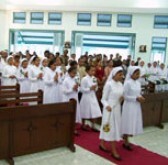 But in administrative respect of our Congregation, Timor Leste becomes under the Province of Indonesia. 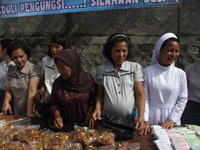 We are involved in various ministries which cover the 9 Dioceses of Indonesia. In our service in health care we try towards the wholeness of human beings. We use this approach in all areas of our work whether it be our patients and co-workers (including their families), or in our community and society as a whole. We are involved in running large and small hospitals in the cities and health care centres in the villages. We also run schools for nurses and the College of Nursing in order to train people to become professional nurses who will work for the benefit of the country. We also provide social/pastoral services in hospitals for patients en co-workers. We look after student nurses and other workers who live in our dormitories. Our Foundress started this ministry by admitting poor children in order to lay a solid foundation in their hearts. She taught them catechism and needle work, and how to pray and love God. It was a form of non formal education. In this spirit we continue to involve ourselves in ministering the ‘formal’ and ‘informal’ education as once needed in Indonesia. Now we run our own schools as well as those from other Foundations in cities, districts and villages. Most of our school compounds consist of Kindergarten, Elementary, Secondary and High School. We also run Colleges for secretaries and social workers. At our schools, students not only study sciences, they also learn about life. They are taught to love their neighbour, to respect human life, to care for those who suffer, to live in simplicity and to be polite. We dedicate ourselves to this ministry by giving special attention to our students. We help them to develop their personality and dignity as women. 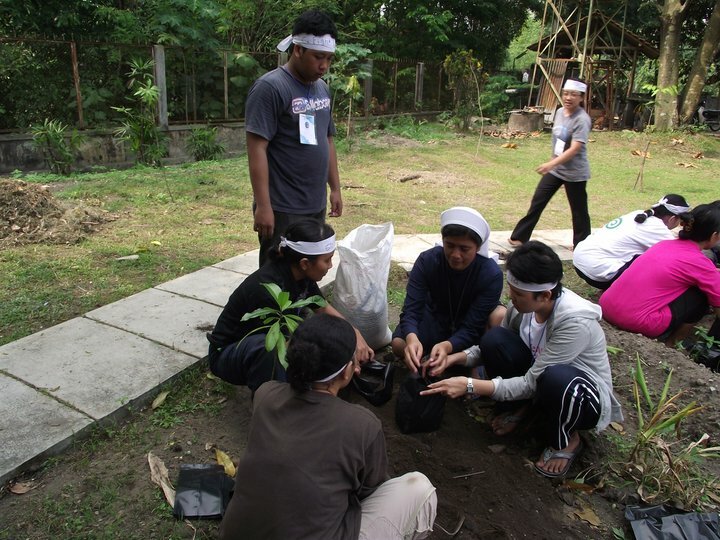 We teach them how to live in harmony with others and develop their social responsibility. 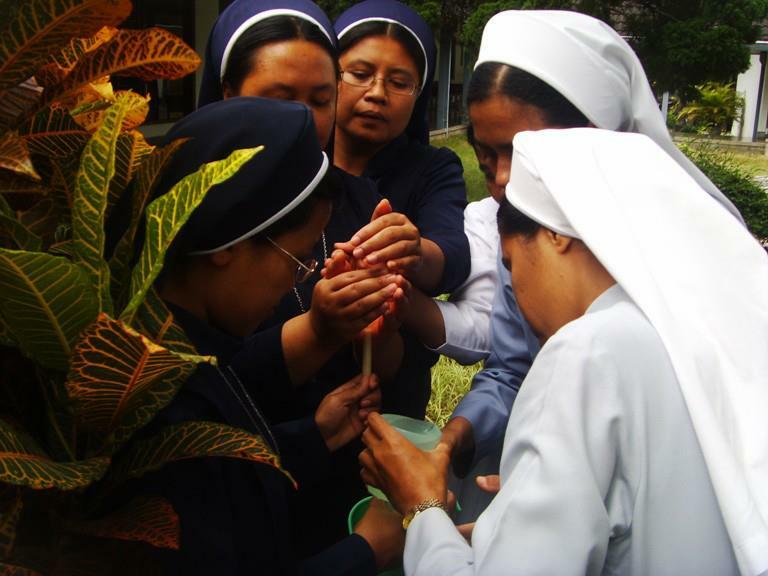 In an attempt to observe the spirituality of our Foundress, we have chosen the social field as one of our ministries. We continue to give shape to this by involving ourselves in the reality and struggles of the poor in today’s world. The social services we render are various e.g. we care for orphans, single mothers, handicapped children, drop-outs, and street children. Besides, we run social rehabilitation programmes, set up social-economic development plans for villages, and encourage social consultation. The pastoral approach we use is working towards the wholeness of human beings. We believe that, in this way, we can bear witness of our being religious in the spirit of our Foundress in the harsh reality of today’s world. We hope that this pastoral attitude is reflected in all our services: in health care, education and social services. We are involved in pastoral ministries and in building up basic Christian communities in the parishes, prayer groups in sub parishes, pastoral ministries in schools, some youth organizations, hospitals, homes for the elderly, etc. We also run retreat houses.